So, remember when I posted about the Zaycon chicken and I was wishing for the Tilapia to come? Well, IT DID! I jumped on it immediately and The Hubs and I have been in fish heaven! One of my very favorite things about it is that it cooks up so quickly and is a mild, delicious fish. 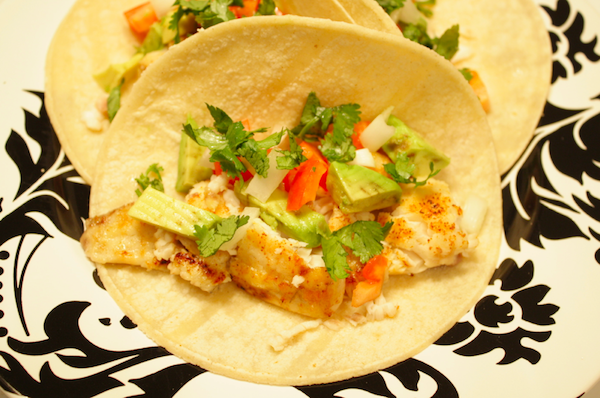 So I figured I’d share one of our favorite new recipes with you! It’s fast, yummy, and you won’t be sorry! 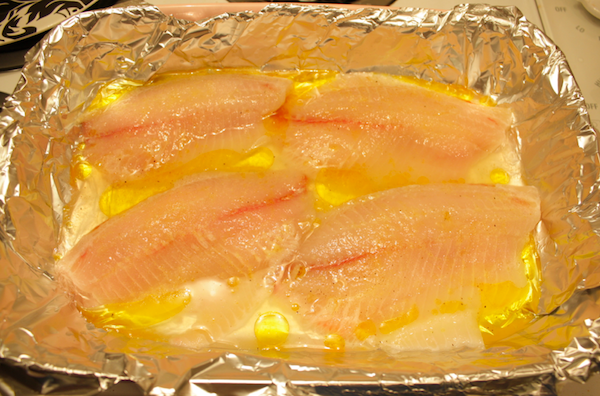 First I take a few fillets in a lined baking dish. I put a little olive oil on them and squeeze a lot of fresh lime juice over top. A sprinkling of garlic powder on top and throw them under the broiler for a few minutes (mine took about 10). While they’re broiling, chop up some white onion, avocado (pretend it’s not brown! ), cilantro and tomato. I have 2 piles of tomatoes because I have to cut the seeds out of mine in order to eat them. I can’t eat citric acid or it kills my tongue! I let the fish sit for a few minutes on the cutting board before cutting it. 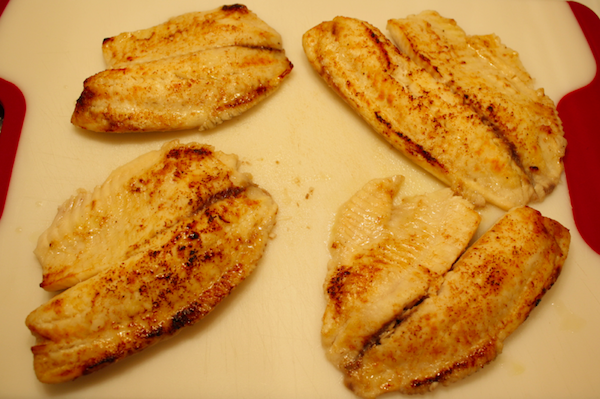 The fish should be flaky and white when it’s cooked properly. Check it often, if you leave it too long, it’ll be tough and rubbery. No one likes tough and rubbery fish! Doesn’t it look delicious?! 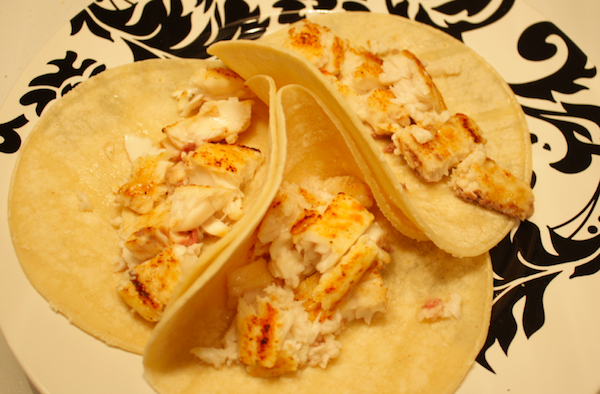 Then I cut the fish into chunks and put it into my warmed corn tortillas. 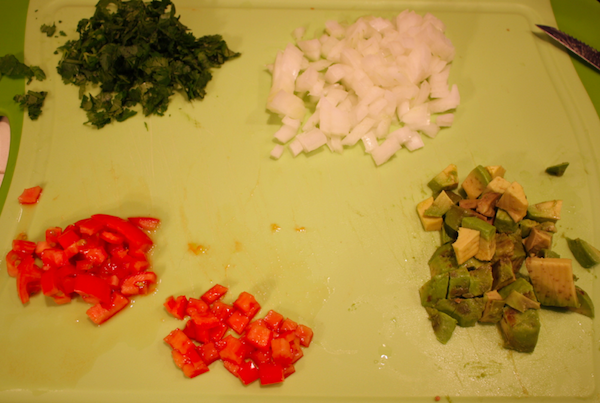 Then I place the rest of my toppings on the fish and finish with another squeeze of lime. I love the lime! 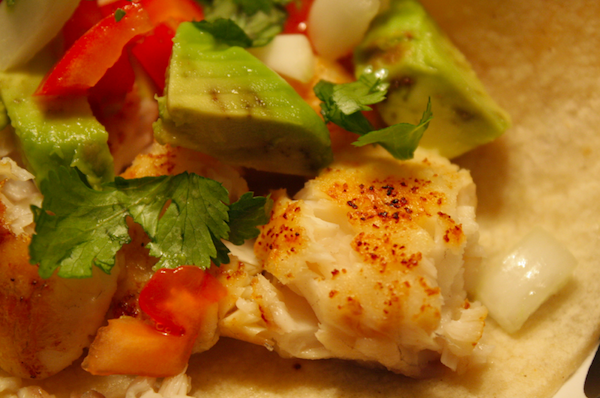 This sounds delicious, and it’s much simpler and easier than the recipe I’ve used before for fish tacos. (Also healthier, since my old recipe calls for frying the fish, albeit in only a small amount of oil.) I’m going to use your recipe next time. Thank you for posting it. I am somewhat puzzled by your comment about citric acid. Although there is probably some citric acid in the seeds of a tomato, most of a tomato’s citric acid is in the juices, with the highest concentration in the watery pulp surrounding the seeds. Removing that pulp (taking the seeds along with it, most likely,) is what would benefit someone who is intolerant of citric acid. Lime juice, however, is one of the most concentrated natural sources for citric acid extant (surpassed only, I believe, by lemon juice). In comparison, the amount of citric acid in tomatoes is relatively minimal. Your ability to not only to tolerate, but also to enjoy, lime juice seems to indicate that the lesser citric acid content in tomatoes is not what causes your reaction. Granted, you are ingesting more tomato than lime juice, but you are still getting more citric acid from the lime juice than you would get from the tomatoes, even without removing the pulp surrounding the seeds. A 2009 study done in Germany and published in The Journal of Proteome Research provides evidence that certain proteins specific to tomato seeds cause more allergic reaction in the mouth than the proteins in the tomato pulp. So since removing the seeds benefits you, sounds like those proteins possibly could be the culprits in your case!